Flotator - Ecokube sp. z o.o. 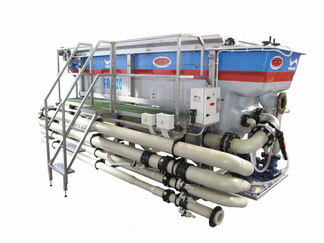 The flotator is used to remove solid particles along with light fractions floating on the surface of sewage. The device uses the process of flotation, in which contaminants attach themselves to miniature air bubbles and form a compact cover. The process is up to five times faster than in the ordinary sedimentation process. The system also enables the agglomeration of gas particles, which doubles the rate of gas migration towards the surface. As a result, the solids are quickly eliminated. Sewage in the flotator are mixed with clean liquids. Due to the right shape of nozzles, the amount and size of air bubbles lead to the best possible adhesion and absorption of pollution particles. Particles of air and pollution head to the surface where they are dehydrated and removed with a special device. Heavy screenings, sand for example, gather at the bottom of the container and they are removed to averaging or initial tank by an automatic pneumatic valve. Sludge is gravitationally removed in the flocculation pipe. Solids are removed faster if a coagulation-flocculation system is installed before the flotator. Then the efficacy reaches 95%, it is also possible to reduce about 40% of BZT5. This is due to the fact that the optimal structure and size of particles is obtained. On the operational level fat separators are similar to flotators. Oil and fats are separated with the use of gravity laws and flotation process. The shape of deflectors inside the separator compels the right flow of sewage and makes it impossible for separated fat substances to leak from the separator. 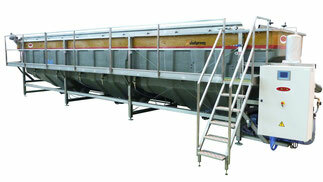 Separators eliminate between 80 and 100% of fats that are not in emulsion. This device contains also deflector and inspection holes, which make it easier to keep the machine in the right technical state. Sludge thickeners provide optimal wastewater treatment by reducing the concentration of solids and maximizing sludge concentration. They are made from GRP, AISI304 and PP steel. Our devices have the flow between 1 and 90 m3/h.